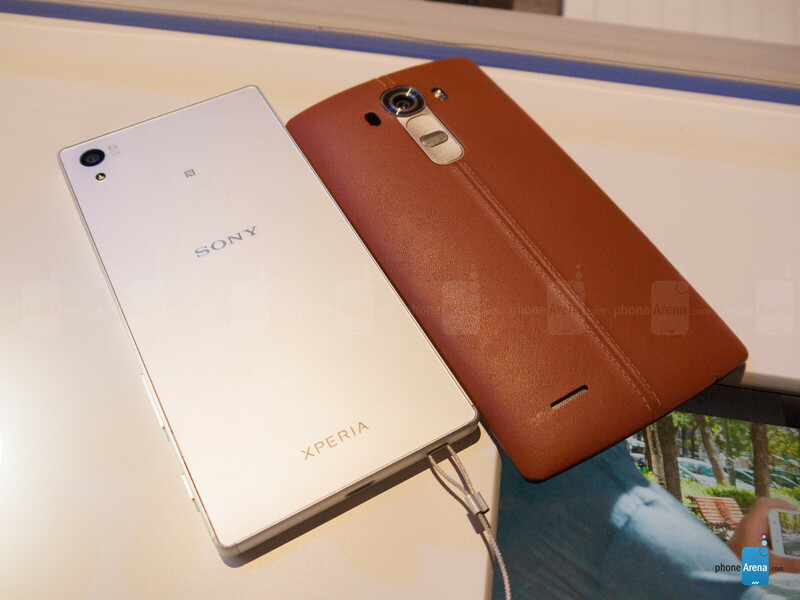 Now that the Xperia Z5 has officially become matter of fact, we're keen to get some early looks and comparisons going! 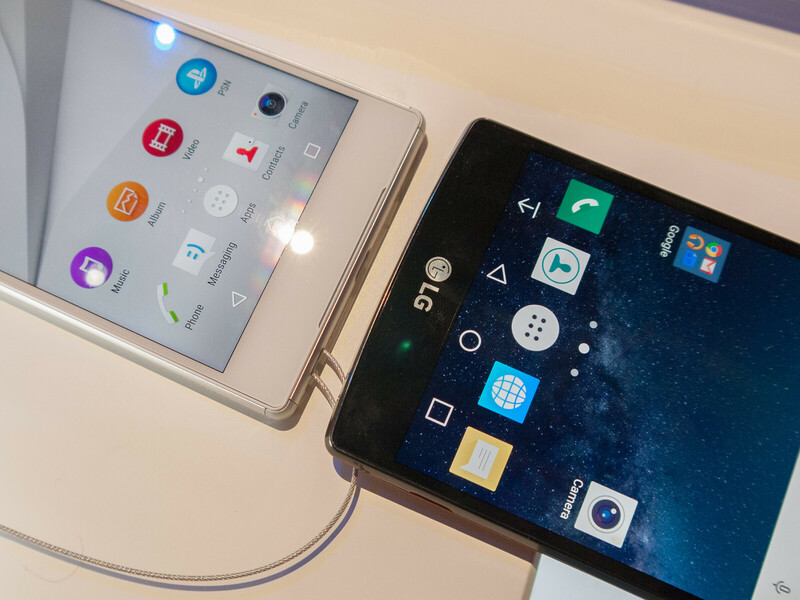 One that we definitely feel like putting against the new Sony flagship is LG's current numero uno, the LG G4. The leather-backed phablet is definitely among the more interesting offerings to emerge throughout this year, so we deem it, in fact, very worthy of being compared with Sony's beautiful beast. Let's see how this will go down! We've sung our praises for Xperia handsets' appearance and build many times before, but we've never turned a blind eye to the fact that Sony's design evolution has been a slow process of subtle reiterations, just like Apple's. However, Sony's habit of releasing two flagship smartphones a year backfired by really bringing Sony's reservedness for novel design ideas into people's attention. Unsurprisingly, we are going to do the same thing for Sony's fifth-generation flagship smartphone. Yes, the Z5 is a total looker with its elegant and understated metal and glass build. Yes, it's also waterproof, which we, along with countless Japanese women who bathe with smartphone in hand, adore. It also doesn't bring anything new to the table, save for a "frosted glass" finish that's matte and less slippery than before. Otherwise, the Z5 features a unibody with design that is clean and sleek, with a metal frame that has tapered, slightly rounded metal edges. It goes without saying, then, that a removable battery is out of the question, although Sony still includes a microSD slot for those who care. At the right side of the phone, we find the usual set of hardware buttons Sony likes to put on its phones - a camera shutter key, volume rocker, and a power button that features an embedded fingerprint reader inside. Nice! Let's turn our attention to the LG G4, now. LG's flagship smartphone has a very different understanding of premium, for its looks are nothing like the Xperia Z5's. The LG G4 is the complete opposite. It puts the "warm, organic touch of leather" against the cold, hard industrial look of present-day flagship smartphones, making for a completely different feel for build quality and design philosophy. This rings true even if you remove the leather from the equation and take a look at the "plain plastic" LG G4 flavor. Without the leather back representing LG's fashion-rooted understanding for luxury, the LG G4 is pure utility, right down to the presence of a removable battery, microSD card slot, and an IR blaster. However, utility isn't without its quirks - the LG G4 is still the only flagship smartphone kicking it with its power and volume keys placed on its back. 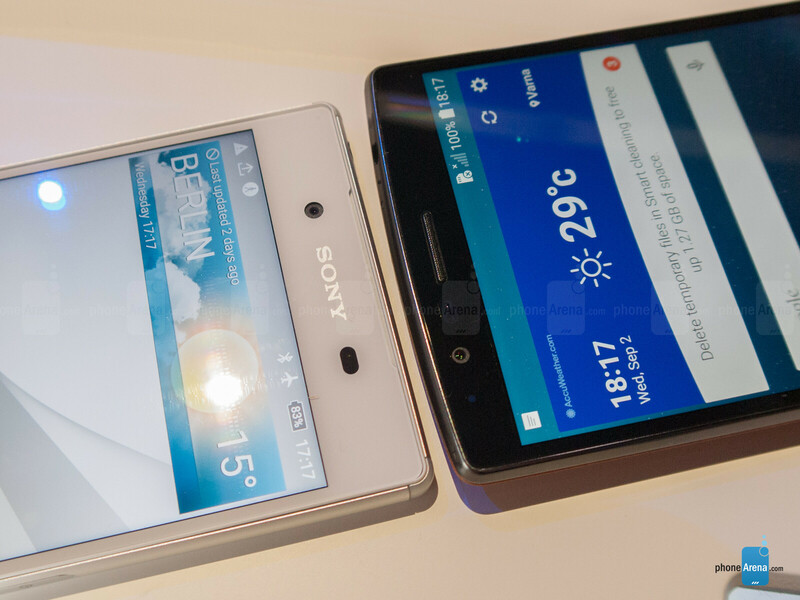 Dimensions-wise, the Sony Xperia Z5 measures 5.75 x 2.83 x 0.29 inches (146 x 72 x 7.3 mm), at a weight of 154 grams. Comparatively, the LG G4 is taller, wider, thicker, and heavier at 5.86 x 3.00 x 0.39 inches (148.9 x 76.1 x 9.8 mm) & 5.47 oz (155 g). If one-handed usage is a concern of yours, you're definitely better off researching smaller smartphones. Even though Sony released the world's first 4K resolution smartphone without batting an eyelid, it somehow managed to restrain itself from upgrading its flagship handset's screen to a resolution higher than good ol' 1080p. Ah, well! The Z5's 5.2-inch display is still an IPS LCD panel with a pixel density of 441 pixels per inch that's equipped with Sony's Triluminos and X-Reality image enhancements, ported straight from the company's television sets. Unfortunately, we don't have the exact display measurements to assess the display's most important properties in full, but the time for this will most certainly come. 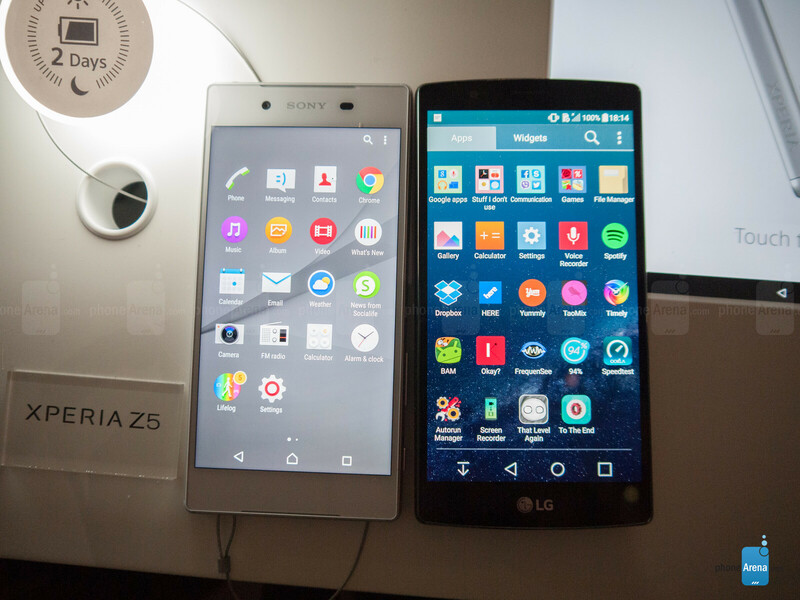 As for the LG G4, it is yet another example of modern day IPS LCD technology in action. Not just plain old LCD, mind you, as LG couldn't resist the opportunity to tinker with it, being a TV maker and all. Thus, the LG G4's panel comes with a wider color gamut, tastefully boosted tones, and a sharp-as-nails Quad-HD resolution that amounts to a pixel density of 538 pixels per inch. It definitely isn't the most color-accurate panel around, but then again, neither have Sony's displays been examples of lifelike color reproduction. We'll be saving our final judgements for the Xperia Z5 review and in-depth comparison with the LG G4 we're about to do when the Z5 lands in our hands. But right off the bat, having spent some quality time with both devices in our lifetime, we're keen to tell you that their displays are just dandy for multimedia and video games, as they are big, bright, saturated, and have a nice contrast response. Both the Xperia Z5 and the LG G4 are Android Lollipop devices, but the similarities in their user experience are few and very general. Basically, both have that straightforward "stock Android" feel to them, but whereas Sony's design is more like Android au naturel with some proprietary apps, widgets, and services stacked on top, LG's experience is very colorful and human-centric, in that lively Korean manner. The Xperia UI is very simple and intuitive. Homescreen editing is a breeze with easy options to add, remove, or change pages, widgets, apps, wallpapers, and themes. The multitasking key brings up the current apps in memory in the Lollipop card-based swipe format, as well as the ever-useful Small Apps suite, which accomplishes basic multitasking by means of apps contained in small, resizable floating windows. Functionally, the LG G4 bears many of the same core features of LG’s experience, such as Knock On to turn on/off the screen by performing a double tap, QSlide apps that get placed over whatever we’re doing, and Dual Window for true multi-tasking with apps running side-by-side. Clearly, the experience caters to all sorts of users, including power ones who yearn for a deep and functional experience. There are some useful tricks too in tow that enrich and simplify the experience, like the pull-down gesture when the screen is off to quickly peek at the time, a quick help guide, and Smart Notices that dish up useful tidbits. For example, Smart Notices reminds us that there’s rain in the forecast, so it’s a good idea to bring an umbrella. Just like the Sony Xperia Z3+ before it, the Xperia Z5 works on the back of Qualcomm's latest hi-end silicone, the Snapdragon 810, paired with 3GB of LPDDR4 RAM. Interesting enough, this same configuration powers the 4K resolution Xperia Z5 Premium, so you might be curious about Sony's hardware decision. Thing is, the Snapdragon 810 has actually been Qualcomm's 4K end-to-end solution all along, while the Snapdragon 808 is envisioned as the 2K resolution platform. However, smartphone manufacturers almost always want the latest and greatest for Qualcomm, which is why Sony and most of its competitors went straight for the 810. Not LG, though. Our Korean friends supposedly chose the Snapdragon 808 from day one, designing the LG G4 to make the most of its abilities. The leather-clad flagship also comes with 3GB of RAM, although it's the less fast, but still ripping LPDDR3 kind. From our experiences with the Xperia Z3+ and the LG G4, we can tell you that the Snapdragon 810 is a more potent gaming platform than the Snapdragon 808, because it's got a substantially more powerful graphics unit. In addition, the Z3+ and the Z5 run a lower screen resolution, which means less pixel pushing for a GPU that's faster than the Snapdragon 808's, tasked with handling the LG G4's Quad-HD resolution. However, the Snapdragon 810 has always had trouble sustaining peak performance before heavy-handed speed throttling is applied to reduce heat generation. Comparatively, Snapdragon 808 are more consistent in their performance, even if they are less powerful by design. Storage-wise, both the Xperia Z5 and the LG G4 come with 32GB of expandable storage, which must be great news for everyone! Pop a cheap microSD card in that slab of Android goodness, and you're ready to roll. Both Sony and LG take pride in their smartphones' camera prowess, so it comes as no surprise that the Xperia Z5 and LG G4 boast same major photographic artillery! But even though LG can still stand on its own with that wonderful 16MP rear unit and color calibration sensor combo, nothing comes close to the Xperia Z5's 23MP cam sensor, a special treat that Sony had been "hiding" away from its camera sensor clients so the Z5 can land dibs on it. While we still don't have full resolution sample photos from the Z5 to make a proper assessment of its camera performance against the LG G4's, we are going to add one as soon as we manage to shoot some photos. We expect very good results out of that mighty sensor, considering it has to be an improvement over the Xperia Z3+'s already excellent imagery. In addition, the Z5 is said to boast the fastest auto-focus speed around, which adds to the impressiveness. Meanwhile, the LG G4 made a name for itself with capturing remarkably natural colors and having a soft spot for fine detail. Fans of sharp and punchy-looking images won't necessarily be into the soft, evenly exposed images generated by the LG G4. But, then again, there's always the possibility of capturing .RAW photos and editing those to your heart's content! Speaking of RAW images, both the Xperia Z5 and LG G4 have camera apps with manual shooting modes, letting knowledgeable or adventurous users take full advantage of these beasts' state-of-the-art camera sensors. Oh, and selfie-taking enthusiasts will get a kick out of the fact that the Z5 and G4 have 8-megapixel front-facing cameras, perfect for capturing big and detailed images for your thriving Instagram account. Hopefully, Sony has found mercy and turned off the overblown skin smoothing thing, or at least provided an option to remove it this time around! So, the Sony Xperia Z5 has mostly the same hardware as the Xperia Z3+, and comes with about the same 2900mAh battery unit (the Z3+ has a 2930mAh battery). That can't be good news for battery longevity, as the Z5's predecessor posted the worst battery test result out of all the Xperia flagships we've tested through the years. At 7 hours and 15 minutes of constant on-screen use, the Z3+ still racked up a better result than most of this year's hi-end smartphones, including the LG G4 and its middling score of 6 hours and 6 minutes. Hopefully, Sony has managed to extract another hour or two of operation out of Qualcomm's temperamental chipset. The Sony Xperia Z5 and LG G4 are very competent smartphones, but their vast design and considerable hardware differences turn them into rather personal choices. 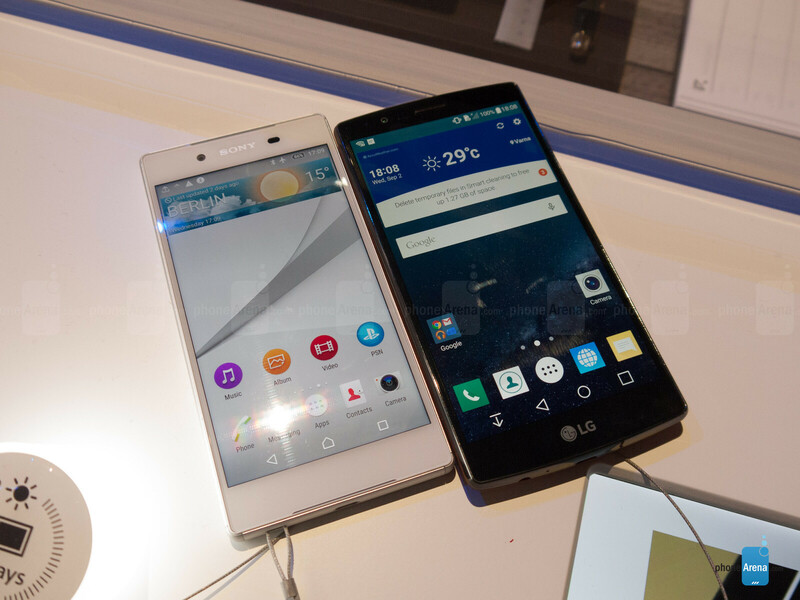 It's either the Sony way or the LG way, as there hardly are places where the two smartphones overlap. However, both have their distinct design charm, offer lots of competent functionality, and their screens are sure to please mass consumers and their love for bright, punchy colors. Where sales are concerned, it has to be noted that the LG G4 can be had for about $500, which is a very fair, and dare we say, aggressive price for a smartphone this up-to-date. The Xperia Z5 is going to command a $100 premium, at the very least, but it's got some other advantages besides the subjective one that is its modern design. A more powerful chipset and a bigger camera sensor might be worth the price of admission to some of you. The LG G4 even with its 16mp camera will beat the 23mp of the sony,especially in lowlight shots. Can you show me the lowlight pictures taken by both of these devices? don't think like a fanboi, wait till they're both compared on youtube. Actually, the former Z3 takes better low light images than the G4. That camera sounds pretty hot, but the SoC sounds hotter. Just got the LG G4 and can't be happier. Not the best hardware I paper but it's optimized really well and I love the features LG has added specially the "Knock On to turn on/off the screen by performing a double tap". Also there is a built in clip tray, ability to backup the hole phone into sd and many useful features. Sony makes good hardware but I reall like having removable battery. I don't care about metal since the front is the same for all phones and I use a cover.although I don't think I need that for this phone.pretty nice of LG since they included a extra back cover . yep, I love my G4 as well. It's not as snappy as my S6, but it's close. G4? are you f***ing kidding me? g4 is the ugliest smartphone ever. z5 look 10 times better.